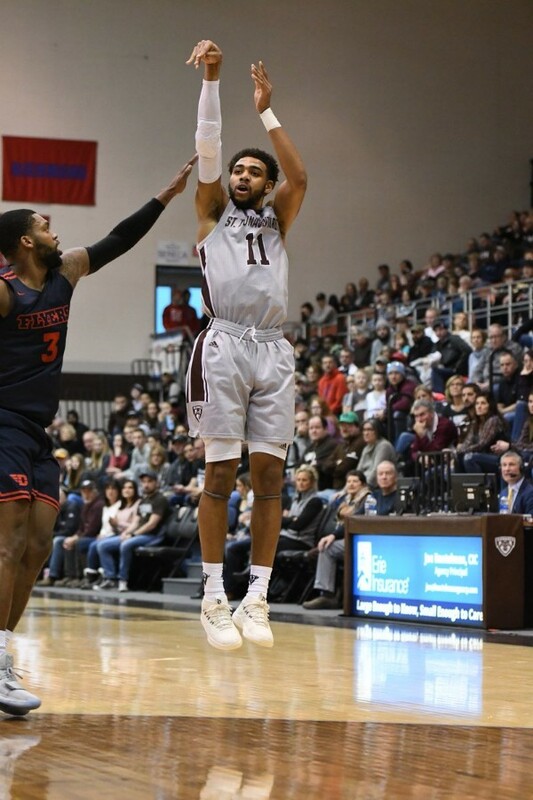 Saint Bonaventure, led by head coach Mark Schmidt, returned home on Saturday afternoon to do battle with Dayton The brown and white lost to Dayton in Ohio last season. However, the Bonnies have won 14 straight A-10 contests at home. Schmidt currently holds 198 wins as the leader of the Bonnies. When he entered Saturday’s game, he needed four wins to become the winningest coach in school history. The Bonnies played without Jaylen Poyser and Nelson Kaputo on Saturday. Less than six full minutes in the Bonnies went down 5-0. The first bucket was made by Trey Landers. At the 15:22 Mark Josh Cunningham took the lead out to five with a three. Senior Courtney Stockard finally broke the ice with a layup for the Bonnies with 14:27 remaining to pull within three. Shortly after that, Landers added two more to the board for the Flyers. Twenty seconds later Amadi Ikpeze went 1-2 at the line. After some mishaps from both teams, Ryan Mikesell dunked one as he was assisted by Jordan Davis. Sixty-one seconds later Mikesell made a jumper to pull ahead eight. Ladarien Griffin then tried to get the Bonnies heading the right right direction by making a jumper. It worked for a short time because of a Kyle Lofton steal and Osun Osunniyi dunk, which Lofton assisted. Jalen Crutcher derailed the train by drilling a three-pointer. Ladarien Griffin then pulled through with a bucket to pull within seven. It was then Obi Toppin that helped Dayton pull ahead by nine. Stockard then made a layup and two free-throws resulting in a five-point deficit and then Alpha Okoli made it a three-point battle. Cunningham dished out a jumper. Dominick Welch then dished a three for Bonaventure. Then, things got boring again until about the four-minute mark in the first half. At that point, Griffin made a three-pointer. Sixty seconds after that Stockard ended a scoring hiatus pulling the Bonnies to within three. With 2:03 remaining Lofton tied it up with a three-point basket. The drama continued with Cunningham making a bucket and the plus one after he was fouled on the shot by Osunniyi. A Stockard jump shot pulled them within a single point, but seconds later Lofton made it a one-point Bonnies lead. A pair of shots from the charity stripe by Osunniyi made it a three-point game in favor of the Bonnies. Out of the locker room for the second half, it was a strong defensive start for the Bonnies. The first points of the half came after Davis made the tying three for Dayton. Griffin pulled the Bonnies back within two again, then Crutches put the Flyers in charge by one. Then, thanks to Stockard and Griffin, the Bonnies led by five. Stockard was then called for a block. Cunningham would go to the stripe and miss both chances. Lofton made a shot to go ahead seven. Dwayne Cohill made a bucket for the Flyers. Not much happened and it was the Bonnies by seven and they added three to go up ten. The Flyers pulled to within eight at about the 6:43 mark, they cut it to seven. Stockard put up points 27 and 28 on the board. Cunningham went 1-1 from the stripe to make it a five-point contest. Griffin put the lead to seven and Mikesell put it back to five but, not for long after a Griffin dunk and the crowd went crazy. Dayton made a shot from the stripe, then followed with a layup. Landers made a layup and got a chance at the and one that he made. Okoli made a pair for the Bonnies. All of a sudden, Crutcher drilled a three and it was the Flyers by one. Osunniyi drew his fifth foul and Cunningham made both free throws. Amadi Ikpeze made two from the stripe, then Crutcher pulled Dayton ahead one with less than a minute left. Stockard made two from the stripe to go ahead by one. Dayton followed suit with a Toppin layup. Lofton went to the line makes one out of two to send the game into overtime. To start the extra period, Ikpeze puts the Bonnies up by two, but not for long because Mikesell made a three-pointer. Davis stole the ball and put it in. Welch tied it with a three-pointer, then it was Crutcher from three-point range. Welch then went 1-1 from the charity stripe. Griffin then missed a rebound and, put it back in. Eventually, Lofton made two from the stripe and the game went to a second overtime. Dayton controlled that one with some shots. Griffin almost made the buzzer beater three to tie it, but he was unsuccessful. A tough loss for the Bonnies, but it is now back to the drawing board as they will go to UMass on Wednesday.